A $24 million transformation underway in one of Auckland’s most popular harbour-side suburbs includes a major redevelopment of its marine gateway. First settled in 1840, Devonport is one of the oldest settlements in Auckland, and today is known for its charming village lifestyle and gracious villas. It’s a popular visitor destination, especially as it’s easily accessible via a short ferry ride from downtown Auckland. The wharf is just a short walk from Devonport’s main shops, cafes and waterfront esplanade, and a key feature of this historic area. Auckland Council’s $24 million investment aims to protect Devonport’s unique character and public places, with a new $7.8 million library, streetscape layout reconfigurations, infrastructure upgrades and a major redevelopment of the wharf area. That includes Victoria Wharf, which sits alongside the ferry terminal at Devonport Wharf. Built in 1929 in the days of car ferries and cargo ships, Victoria Wharf has more recently become a popular fishing spot. However, since September 2012 it’s been closed to the public, owing to a steady and now serious decline in its condition. BBR Contech has repaired the wharf as part of a design-build consortium with Downer and design engineering firm Peters & Cheung. Our appointment to this high-profile project reflects both our extensive experience with this kind of work and our innovative approach to developing the design solution. We were also able to commit to the tight timeframe of just 12 months for completion, and a strict budget limit of $6 million. 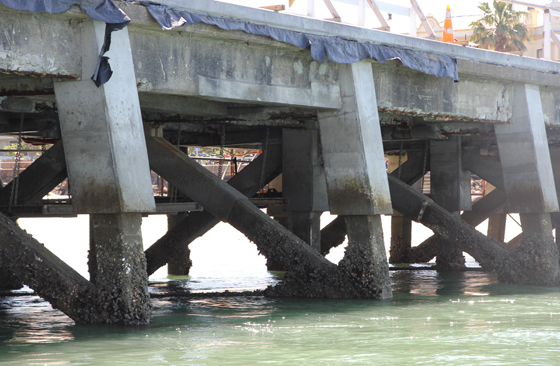 The project involved removing deteriorated concrete from the piles and braces underneath the wharf, installing new reinforcing bars, extending the pile reinforcing and constructing a new decking slab on top of the existing surface. When the wharf reopens in 2014, it will be a significant commercial and recreational asset for the village, the surrounding community and the thousands of people who visit each year.